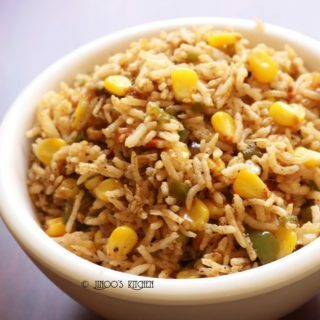 sweet corn pulao recipe | Sweet corn capsicum pulav recipe with step by step pics and video recipe. one of the easiest lunchbox recipes and most loved one especially by kids. 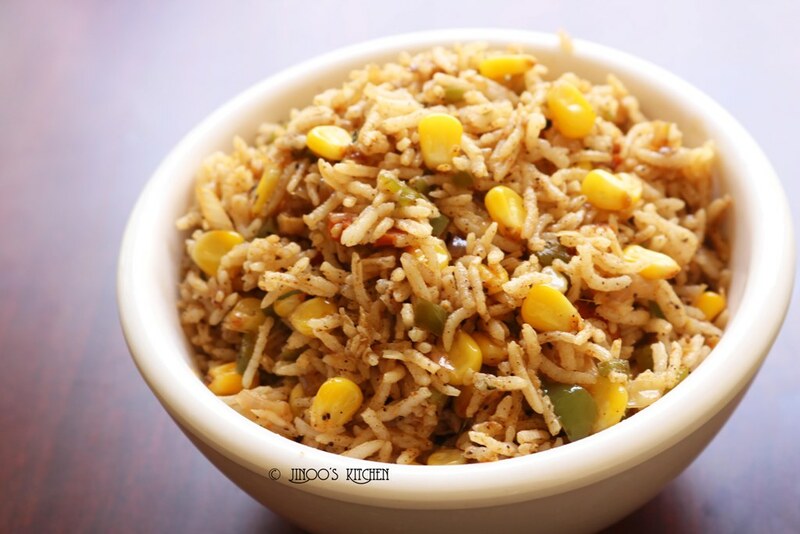 simple steps and mildly flavored corn rice recipe with quick video. firstly, heat oil in a pan and add crushed garlic, crushed ginger, finely chopped onions and one green chilli broken into two. fry these in oil until slightly brown. finely chop the vegetables of your choice. I have used carrots, capsicum and cabbage. Finely chop them and add it to the fried onions. further add chopped coriander leaves, sweet corn and all the spice powder: salt, coriander powder, pepper powder, garam masala and chilli powder. fry this well for a minute and sprinkle little water. close and cook the pan for approximately 5-10 minutes or until the vegetables are cooked. vegetables have to be slightly crunchy so do not over cook the vegetables. do not add more water. you can sprinkle as and when needed. open when the vegetables are cooked, add cooked basmati rice. I have cooked the basmati rice with salt and oil. strained and cool the rice completely before you can add it to the sweetcorn masala. mix gently without mashing the rice. until well combined and put off the flame. 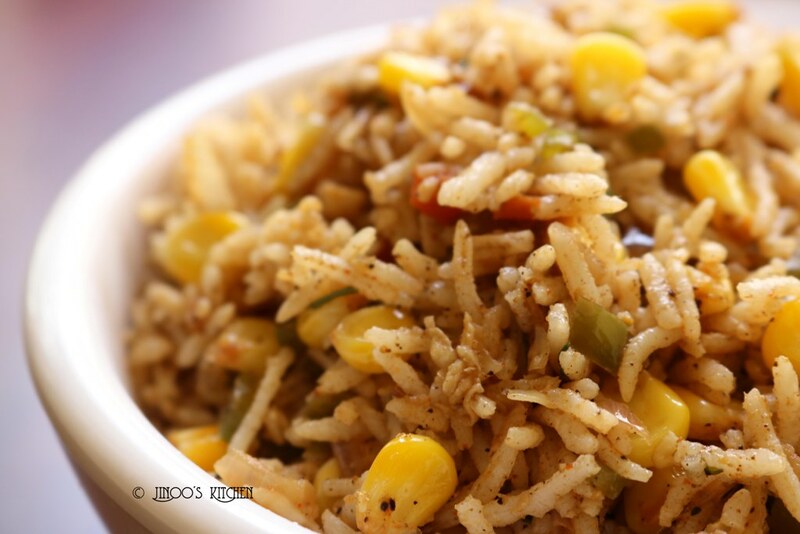 simple, easy and delicious sweet corn pulao is ready. serve hot with tomato sauce! add chopped carrots, chopped capsicum, chopped cabbage, chopped coriander and sweet corn along with salt, chilli powder, coriander powder, pepper powder and garam masala. fry for a minute and then sprinkle little water, close and cook until vegetables are cooked. open and add the cooked basmati rice. gently mix it until well combined and serve hot with sauce.